It's that time again... yes, my daughter has turned 8 years old this year and this time she asked for a Tea Party. So Tea Party it is... 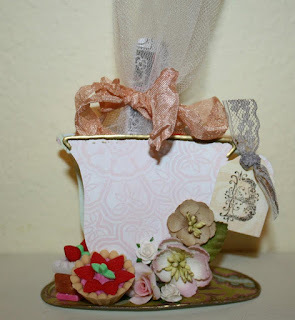 I made this teacup favor using the Sizzix Die 3D Teacup Die. It turned out better than I expected. I wet embossed the rim part of the teacup and the outline of the saucer in gold. I filled it with nail polish, nail file, and chapstick. It was a big hit at the Tea Party. Enjoy!